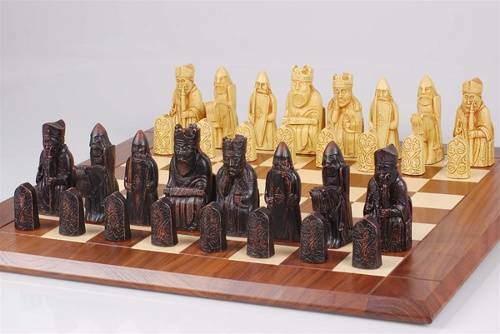 The Isle of Lewis Chess Set is a replica of the original that was discovered on the Isle of Lewis (West Coast of Scotland) and which are now shown in the British Museum of London and in Edinburgh. The Isle of Lewis chessmen were featured in the movie: Harry Potter and the Sorcerer's Stone. Get the Isle of Louis Chess Set - Click here! 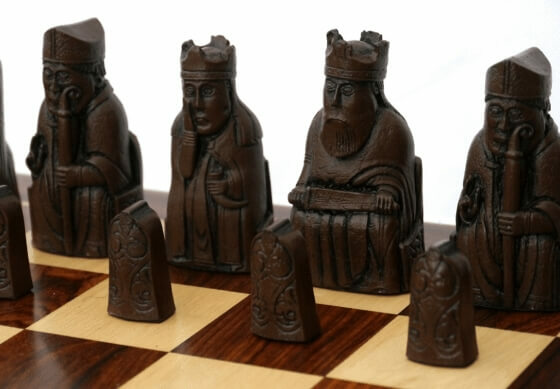 There are many variations of quality with the Isle of Lewis chess set designs. Look for weight and detail as hallmarks of quality. Some Isle of Lewis chess sets are expertly made from crushed stone - they are substantially heavy and very detailed. The Isle of Lewis chess pieces are probably the best-known set of medieval chess pieces. The original Lewis chessmen were discovered on the Isle of Lewis in the Outer Hebrides (off the coast of Scotland) shortly before 1831. 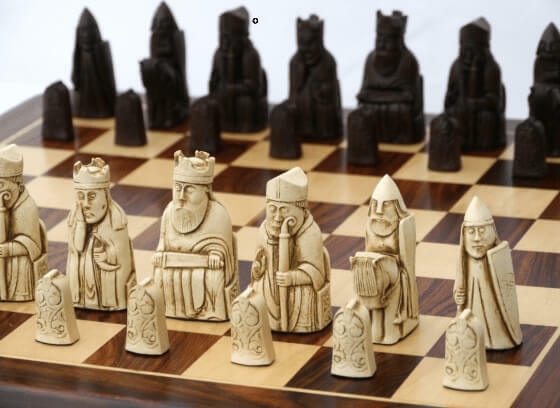 Get the Isle of Louis Chess Set by Berkeley - Click here! 1831 a sandbank on the Isle of Lewis has uncovered a mysterious building that was buried under the sand. A collection of Elves and Gnomes was found. The superstitious man who found it was horrified and ran home. However, the man returned to the spot took the figures home and sold them to a local collector who realized that these figures were chessmen. 78 pieces that belonged to eight or more sets. 67 of them are now in the British Museum and the others in the National Museum, Edinburgh. Experts regard them as the most astonishing collection of ancient chessmen in existence. I hope it is available at the store below. If not, they offer other great chess sets for you.